In a working paper that will be presented in a few months at the HICSS conference, I describe how leveraging technology trajectories is one of four principles of Digital Fitness. Digital fitness is how I refer to the digital capabilities and mindsets required of all organizational leaders in order to succeed in today’s chaotic digitally enabled business world. 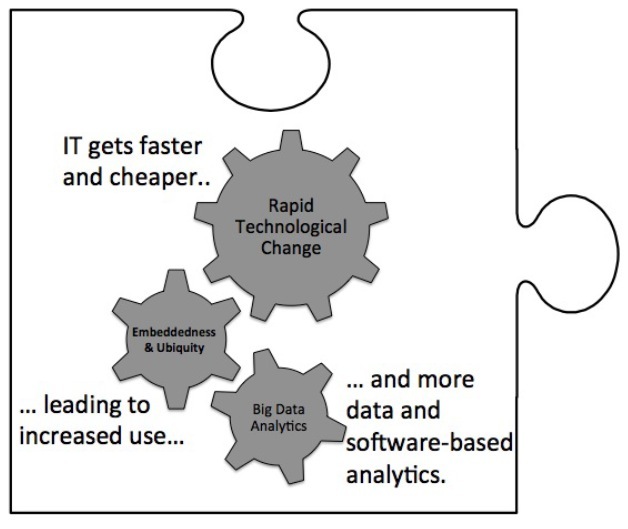 Leveraging technology trajectories is encapsulated by the moving gears in the illustration below. IT continues to get faster, smaller, and cheaper. This leads to increasing and innovative uses to substitute away from older methods or complement existing ones. This ultimately leads to the data avalanche facing most large companies and the use of analytics and other creative software approaches to convert it into value. Source: Melville, N.P. “Digital Fitness: Four Principles for Successful Development of Digital Initiatives,” paper accepted to HICSS-48, January 5-8, 2015. Sustainable business these days requires data, and lots of it. 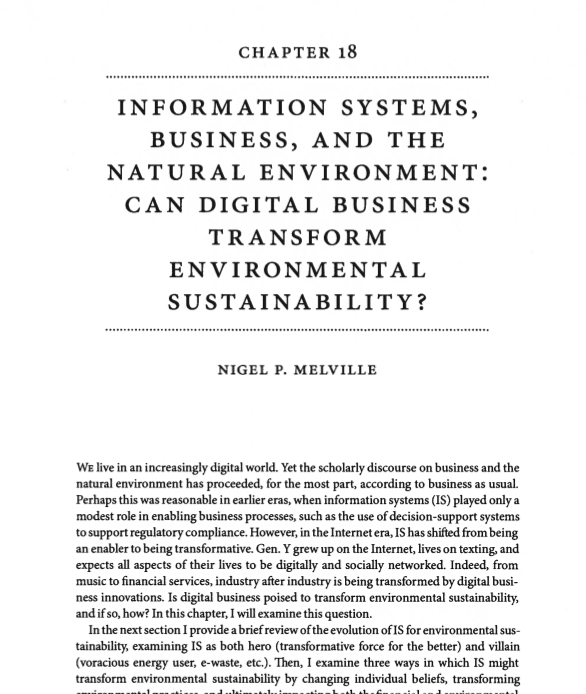 Companies are using sustainability data for a multiplicity of reasons: to inform corporate strategy, comply with regulations, evaluate investments, improve transparency, develop products and processes, manage risk, benchmark themselves against competitors, change organisational culture, and engage with supply chains. Increasingly, companies that take a well-organised and data-driven approach are more likely to see investments in their sustainability programme pay off. This means using analysis to better inform decision making, leading to methodically prioritised initiatives that get off the ground far more quickly. Once the data management programme begins to mature and data inputs are integrated that reach across a company’s financial planning databases and other operational information resources, opportunities for cost savings and revenue generation can be routinely identified and acted upon. My favourite example of an organisation using data to drive sustainable development is the United States Postal Service (USPS). Across 32,000 facilities, their Office of Sustainability designed an employee-led programme to address goals in waste reduction, energy conservation, fleet fuel reduction, consumables spending, recycling, and water use. To aggregate and display relevant data, USPS developed a Green Initiatives Tracking Tool (GITT). This features dashboards that allow cost efficiencies and performance enhancements to be monitored across the organisation. 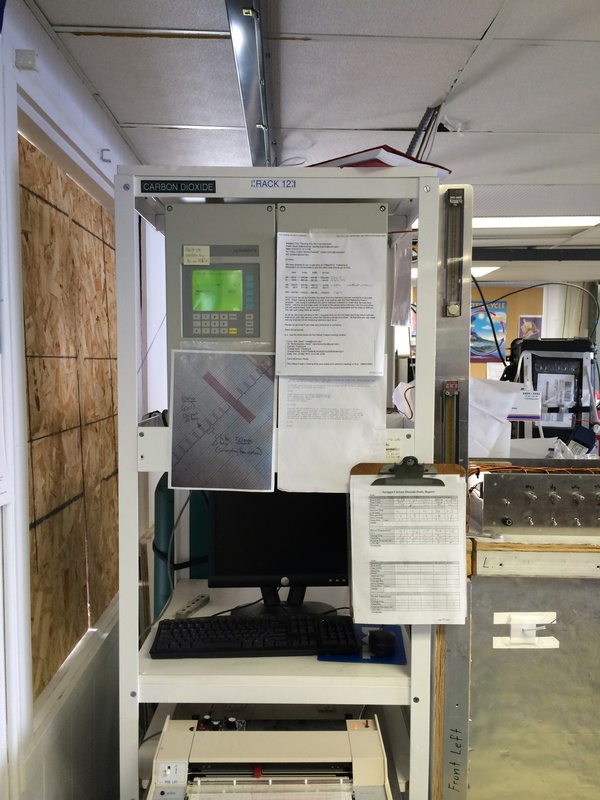 The GITT system achieves this by providing status updates for core projects, as well as financial information, through direct connection with the accounting system for each facility. GITT is also designed to be interactive. It includes a start-up list of 41 suggested projects for facilities as well as guidelines and training modules for their completion. Managers can also understand clearly what projects are in place and where via sustainability performance metrics that are triggered upon project implementation. Ready access to GITT information and comparative tables enable comparison between facilities and geographies. Most importantly, USPS can now track progress in real time at a national level and support those facilities that need additional help. By using data aggregation and analytics, USPS was able to gain visibility into its progress on sustainability and isolate over $52m in savings in 2012 largely due to employee-led initiatives. Unfortunately, as I argue in the article, too many digital initiatives fail to meet expectations. It’s my hypothesis that the lack of digital fitness is one source of these high rates of failure. If this is true, it would be interesting to refine the concept of digital fitness by studying leaders at companies that seem to excel at the intersection of IT and corporate environmental sustainability, including SAP, IBM, Danone, Intel, Nest, OPower, and Ebay. What might we learn? Categories: Innovation, Research, Sustainability 2.0 | Permalink. Several interesting Green IS papers were presented at AMCIS last week in Savannah GA. Extending Enterprise Management Systems: The Case of Energy Management (Richard Rößler, Hannes Schlieter, and Werner Esswein). The Quest for Environmental Information – Towards a Mobile Application for GHG Emission Tracking in Meat Production Processes (Hendrik Hilpert, Bjoern Pilarski, and Matthias Schumann). Learning from Adopters: Critical Factors for Achieving Smart Grid Value, (You Zheng and Jason Dedrick). How Can IT Enable the Simultaneous Pursuit of Green and Business Outcomes? : An Investigation of Smart Grid Innovations (Jessica Pye and Arun Rai). It appears that Green IS scholarship is shifting from generalities to specifics, which I think is a good thing as we move out of the nascent stage and the literature slowly matures. We still need more studies that connect IS investment to environmental and financial value (more on that soon). 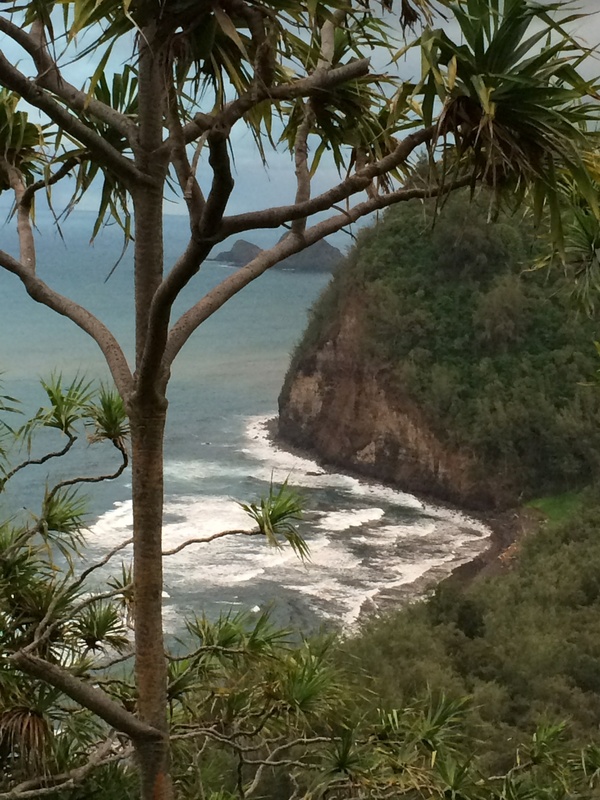 I just returned from the Hawaii International Conference on System Sciences (HICSS) on the Big Island. 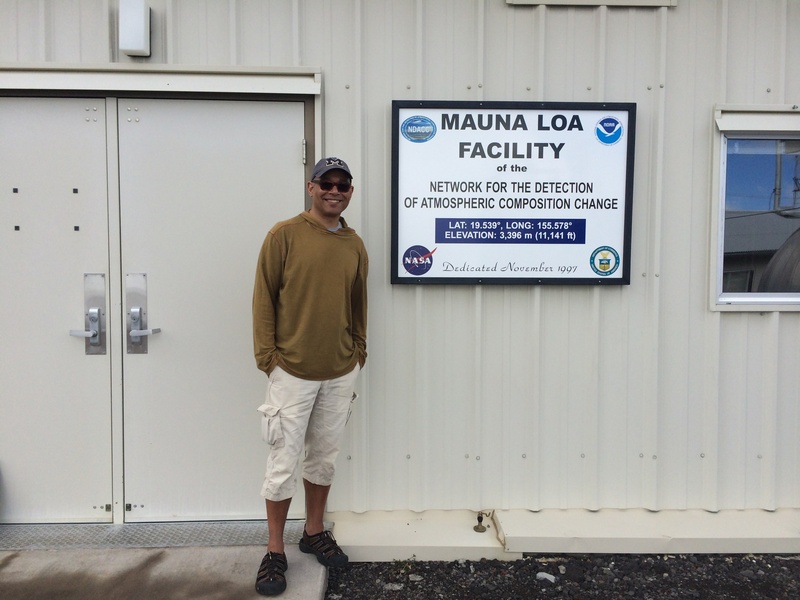 While there, I decided to take an extra day to visit the Mauna Loa Observatory (MLO) located on the Mauna Loa Volcano. As this is a research facility, I was fortunate to get access after contacting MLO Station Chief John Barnes (Thanks John). Here’s me at 11,141 ft, chugging more air due to the reduced oxygen content. In addition to C02, I also got a great overview of solar radiation monitoring. Thanks Ben and Greg. Concentrations of greenhouse gas CO2 in the atmosphere are exceeding 400 parts per million (ppm) for the first time in human history. Given the connection between CO2 and global warming, we are entering uncharted waters for human life on earth. 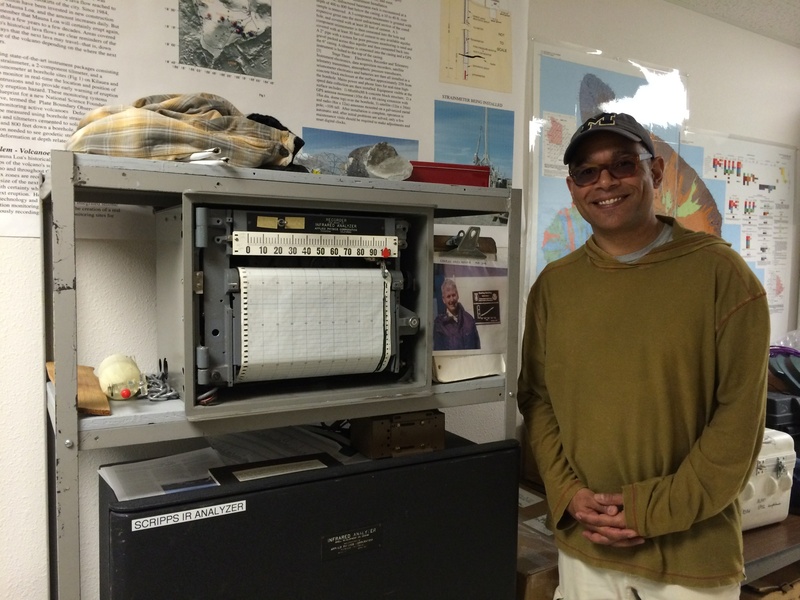 We can’t all visit Mauna Loa to see CO2 measurement first-hand. But we can collaborate to find systemic ways to reduce CO2 emissions and make daily choices that are climate positive. Categories: Carbon Emission, Research | Permalink. Four things I’ve done this year in line with Earth Day. 1. 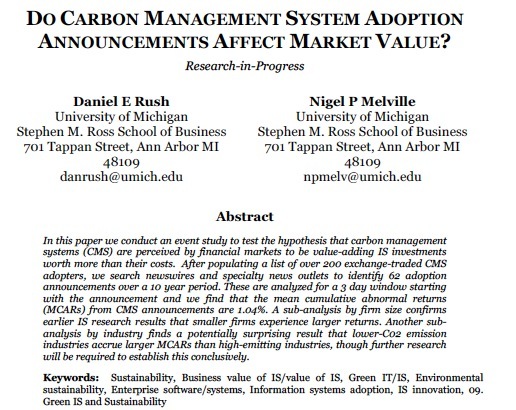 Published a conference paper with Dan Rush suggesting that investors positively value investments in IT for managing energy and carbon emissions (rather than not valuing them because they think it’s greenwashing). Dan is leading the effort to broaden the sample and confirm the findings under more robust conditions. keeping spreadsheet-based systems current with the latest calculation methods and parameters. 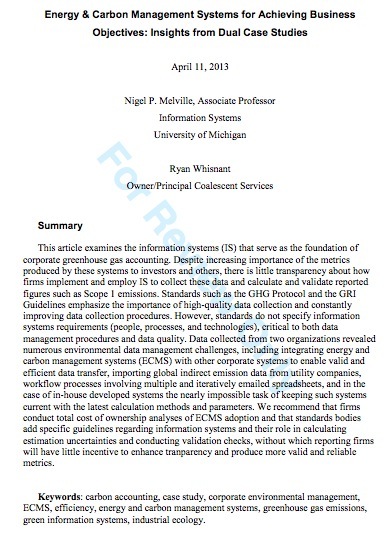 The study recommends that firms conduct total cost of ownership analyses of ECMS adoption and that standards bodies add specific guidelines regarding information systems and their role in calculating estimation uncertainties and conducting validation checks. 3. Attended a green IS conference (Verge) in a green manner (virtually). 4. Designed, developed, and taught an MBA elective that included an online section (is virtual learning more green due to lack of commuting?) for students to learn a design thinking framework and have the opportunity to apply it to projects with a sustainability theme (transport, energy use, local food, etc.). 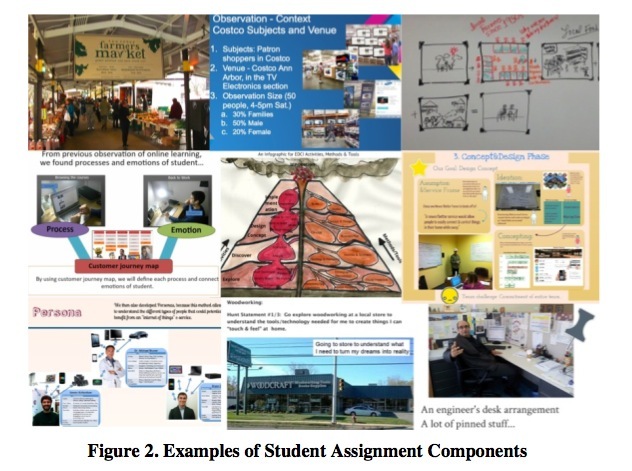 This gets students thinking about the meaning of environmental sustainability (framing), current practices (exploring the design space and synthesizing insights), and how to concept and develop new IT-enabled solutions that satisfy human, economic, and technical constraints. Fantastic experience and student engagement! Not enough, but it’s a start. Categories: Business School, Carbon Emission, Energy & Carbon Management System, Energy Use Measurement, Research | Permalink.